The undisputed glamour queens and kings of the sighthound world, these cousins of the Greyhound are tall, curvy and elegant. 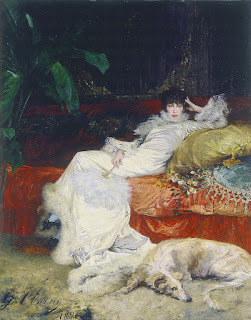 Their distinctive heads and flowing coats are featured in art and fashion photography, and they've been the favored pets of the aristocracy and royalty for even longer. The Borzoi is a sighthound, bred to chase running prey. The graceful, elegant Borzoi was a favorite subject of artists during the Art Deco era. 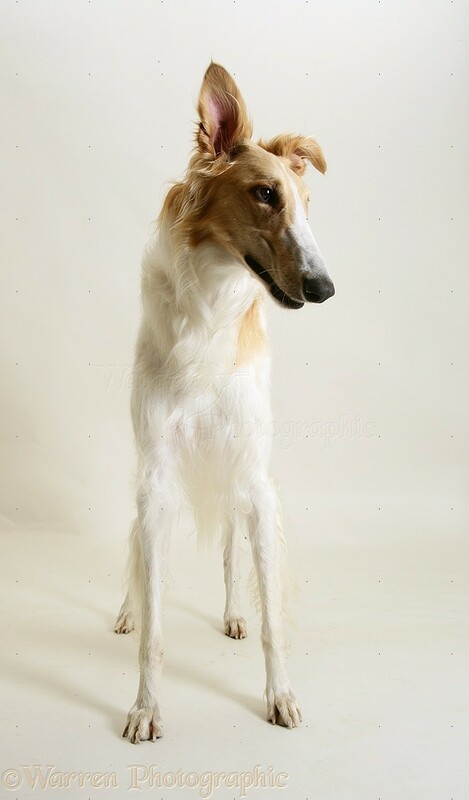 The Borzoi’s long, silky coat can be any color or combination of colors. The Borzoi is a giant breed. During this period, great rural estates with hundreds of serfs and thousands of acres were devoted to breeding, training and hunting with the Borzoi. The breed was pampered and promoted by Russian royalty on a grand scale unparalleled in the development of any other breed. Guests, horses, dogs, tents, kitchens and carriages came by special trains to attend ceremonial “hunts.” More than a hundred Borzoi in matched pairs or trios, with additional foxhound packs and riders on horseback, made up the primary hunting party, with “beaters” on foot to flush out the game - usually a wolf. The Borzoi would pursue the wolf, and the horsemen would pursue the Borzoi, until the dogs captured, pinned and held their quarry. Typically, the huntsmen would leap off their horses, grab, gag and bind the wolf, and then either kill it or set it free. These extravagant affairs involved elaborate attire, feasting and festivity. Several Borzoi were sent as gifts to Princess Alexandra of Britain in 1842, and the breed was exhibited at the first Crufts World Dog Show in 1891. In 1863, the Imperial Association was formed to protect and promote the old-style Borzoi. Many present-day American bloodlines are traceable to the dogs of breeders who were members of this club. Most notable among these were the Grand Duke Nicholas, uncle to the Czar and field marshal of the Russian armies, and Artem Boldareff, a wealthy Russian aristocrat. The first Borzoi to come to America was allegedly brought from England in 1889 by a fancier of the breed living in Pennsylvania. The first American to travel to Russia and directly import Borzois was C. Steadman Hanks, the Massachusetts founder of the Seacroft Kennels in the 1890s. In 1903, Joseph B. Thomas of Valley Farm Kennels made several trips to Russia to obtain specimens of the breed that played a key role in the development of American Borzoi pedigrees, including dogs from the Perchino Kennels owned by the Grand Duke Nicholas and from the Woronzova Kennels owned by Artem Boldareff. 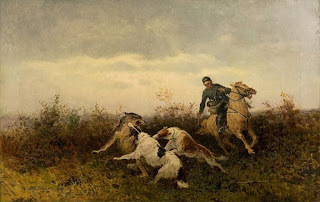 Wolf hunting with borzois (1904), Efim A. Tikhmenev. The Borzoi Club of America was formed in November of 1903, then called the “Russian Wolfhound Club of America.” The breed standard was approved at a meeting held during the Westminster Kennel Club dog show in February of 1904, and the breed club was elected to membership in the American Kennel Club in May of that year. The official breed standard was formally adopted in 1905 and is essentially the same today, with minor revisions made in 1940 and 1972. The breed’s name was changed from Russian Wolfhound to Borzoi in 1936, and the parent club’s name was changed to the Borzoi Club of America that same year. Today, this breed is largely unchanged from its Russian ancestors in both appearance and ability. Borzois are still used by farmers in the Western United States to ward off coyotes. They excel in AKC lure coursing competitions and in the conformation ring. 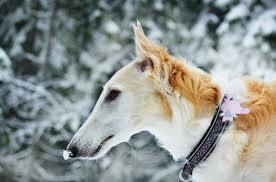 Above all, Borzois are graceful, glamorous, gentle and devoted companions. 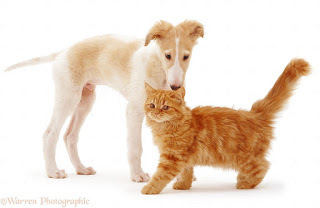 With an average lifespan of 10 to 12 years, the Borzoi dog breed is prone to major health concerns such as gastric torsion, and minor problems like cardiomyopathy and hypothyroidism. The Borzoi reacts adversely barbiturate anesthesia. To identify some of these issues, your veterinarian may run thyroid and cardiac tests on this breed of dog. 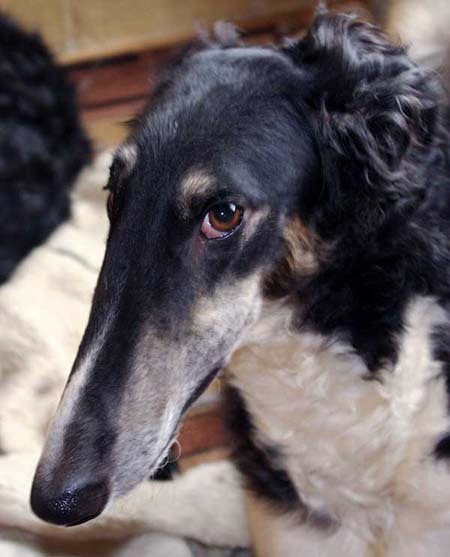 Functioning best as house dogs, with easy access to a yard, Borzoi can reside outdoors in cold weather, provided a warm shelter and soft bedding are offered. 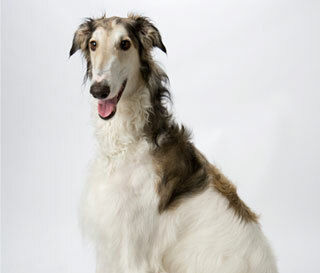 The male Borzoi has a fuller coat than the female, and requires combing or brushing two or three times a week. There are times when the dog sheds a great deal. This breed of dog does well when given a chance to exercise every day with a long walk and a sprint in an enclosed area. 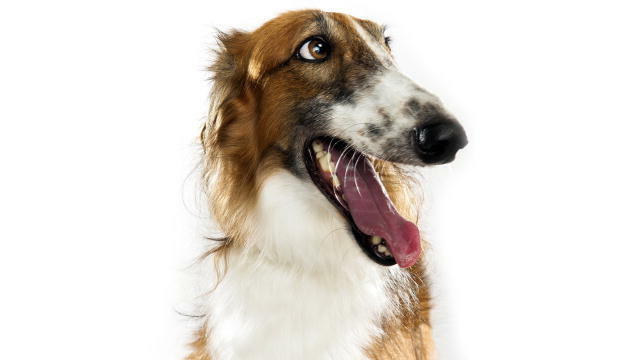 Borzoi should be brushed weekly to keep the coat healthy, manageable and mat-free. Groomers recommend using a pin brush on this breed, as wire slicker brushes can damage the coat. They shed lightly throughout the year and heavy during the change of seasons, so more brushing may be required in the Spring and Fall months. Borzoi are clean dogs whose coats naturally deflect dirt and only require baths on an as-needed basis. Regular ear and teeth cleanings will keep harmful bacteria from building up in the ear canal and mouth leading to infections or bad breath. Nails need to be trimmed once or twice a month. Best for homes with larger yards, this breed is a loyal member of the family. 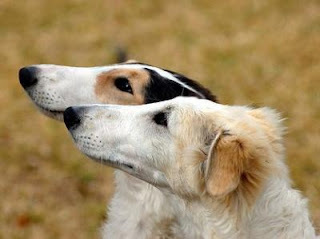 Affectionate to both familiar people and strangers, the Borzoi would make a great pet for someone who has a lot of company. Good with children but not prone to roughhousing, this pet is best suited for families with teens or without children. Likely to hunt and chase smaller animals, this is not a good breed to pair with a cat. Quiet but large, he would do OK with apartment life if exercised regularly. The Borzoi was bred in Russia to course wolves and other game across open fields and, if necessary, to capture and hold it until the arrival of the huntsman. Leo Tolstoy’s novel “War and Peace” has a scene describing such a hunt. Waking up slowly, the Borzoi will quietly sneak downstairs for his daily feeding. After checking out the home, he'll go outside for a run and trail any possible animals in the yard. Once he knows the coast is clear, he'll be ready for a nap in the sun. When his owner gets home, the Borzoi will be patiently waiting for his daily run. After dinner, he'll snooze next to his master.